Tokyo, Japan - Panasonic Corporation will be organizing the "Panasonic Open Golf Championship 2017" from April 20 - 23 at the Chiba Country Club's Umesato Course in Noda City, Chiba Prefecture, as well as the LPGA Step Up Tour, "Panasonic Open Ladies 2017" at the Noda Course, same golf course, from April 19 - 21. At the Rio 2016 Olympic Games, golf returned to the Olympic Games for the first time after a 112-year hiatus. Panasonic, which has been supporting the Olympic Games as an Official Worldwide Olympic Partner for more than 25 years, has began organizing the Panasonic Open once again in 2016 to help contribute to the development of golf as the sport enters a new age. As the concept of this tournament is to make "golf more open" and accessible to all, Panasonic will organize various events for golf lovers, as well as spectators new to golf or who have come as a family such as "The Gallery Hall," the "Farewell Party," and lucky draws. Please come to the Panasonic Open and experience new ways to enjoy golf and witness the passion of the athletes first hand. 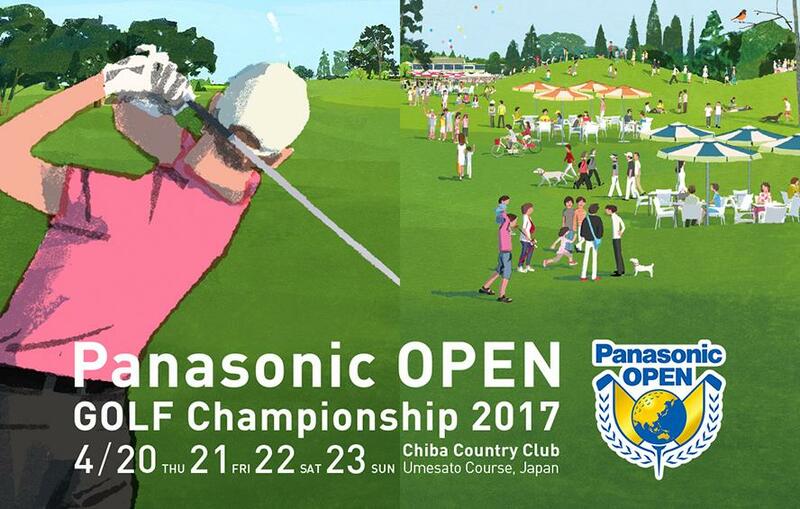 "Panasonic Open Golf Championship 2017"
*May also watch the specified practice sessions on April 19 (Wed). *Please refer to the Panasonic Open homepage for information about tickets and access to the golf course. *Please note that same-day tickets may sell out. Let's party with green DJs! "The Gallery Hall"
At the final round (April 22, 23), "The Gallery Hall" will appear on the 16th (short) hole where spectators will be able to enjoy the tournament with a drink in hand. Takeaki Koyama and Hiroshi Yakushiji will join the party as green DJs and enliven the gallery by providing information about the golf clubs the players selected to tee-off, about their play, and inside stories. Moreover, a lottery will take place where spectators will be able to win Panasonic products and Panasonic Open merchandise according to the number of hole-in-ones and birdies. Meet golfers at the "Fairwell Party"
After the final round on April 23, 2017 (Sun), a Fairwell Party will be held to thank the fans, who came to watch the tournament, and the golfers, who gave the tournament their all. A lucky draw will take place where spectators will have a chance to win Panasonic products and autographed golf goods. Fun for families, too - The "gallery plaza"
The gallery plaza will feature an area where spectators can lay on an air sofa under the blue skies and watch the tournament, a kids park where kids can run wild, 3D foot mapping service, and a shopping area where spectators will be able to buy Panasonic Open merchandise and popular golf gear. Please access online live streaming from the Panasonic Open Special Website. With the cooperation of BS-TBS, contactless vital sensing will measure the heart rate of athletes on camera, giving the audience an idea of the emotional state of these athletes. By making the level of nervousness/tension athletes are feeling visible, the audience will be able to enjoy a dramatic broadcast like never before. Free admission. Come join us at the tournament. 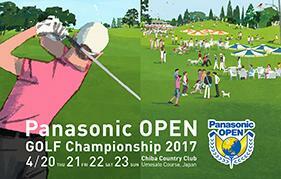 Please access the Panasonic Open Special Website for details. Panasonic will conduct a demonstration experiment of ICT-based spectator solutions that propose new ways to enjoy golf and security solutions that ensure the safe operation of the tournament. Please take a look. We would like to note that Panasonic Newsroom is not a place to address personal Customer Service issues. Even though this is not the forum, Panasonic is always eager to resolve your concerns. Our local customer services contacts can be found at Global Support http://www.panasonic.com/global/support.html or you can see our list of Social Media Accounts to find the right channel for your queries and concerns here http://news.panasonic.com/global/socialmedia/.